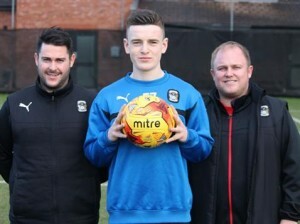 Last week it was confirmed that Darragh Leahy (16) has signed for Coventry City on a two year deal. Leahy, who has recently been selected to play for the Republic of Ireland under-17’s in a number of friendly games, is set to say goodbye to his hometown club St. Kevin’s Boys whom he’s played for a number of years as well as Malahide FC. The 16-year old will join Jason Farndon’s Under-18s group as a first-year scholar and will start playing following international clearance. Leahy’s story is heart-warming one, and highlights much of the good work conducted at DB Sports Tours. DB Sports Tours co-founder David Berber describes the story behind Leahy being spotted by the Coventry scouts late last year. Leahy joins a long list of Irish players to make the trip to England in search of making their dreams become a reality each year. In particular Coventry has often been a destination for Irish people to emigrate to throughout the years, and their link with Irish footballers remains just as strong today. Irish football legend Robbie Keane spent part of his formative years learning his trade at Coventry City in the late 90’s scoring 12 goals in 31 appearances, though the examples don’t end there. Dublin natives Barry Quinn and Jimmy Holmes both left their home to play for CoventryCity in the early years of their careers, setting out a similar path Leahy will go on now. Holmes (61), had a long and established career spanning 20 years, while Quinn (35), is still playing professionally, having began his journey Coventry City. Currently Coventry City have one Irish player in their senior squad; central midfielder Adam Barton (23), though he is currently out on loan at Fleetwood Town. For more information on Leahy’s development keep a keen eye on the blog here.